In Morocco, the traditional way to eat many main dishes and sides is to scoop bite-size portions with a small piece of bread. The various cooked salads, purees, and spreads below are all eaten that way and therefore work well as dips to offer alongside a spread of finger food and appetizers. This Moroccan fava bean dish may be thinned to soup consistency, but it's equally popular as a dip. Seasoned with olive oil, lemon juice, and garlic, it's quite similar in flavor to Lebanese ​hummus. It should be served warm. Olive oil, lemon juice, garlic and Moroccan spices give this dip-like cooked salad its much-loved flavor. Even people who claim not to like spinach tend to enjoy this dish! In the spring, the same preparation is used to cook khoubiza, common mallow leaves. This roasted tomato salad is cooked to jam-like consistency before it's sweetened by the additions of honey, cinnamon, and orange flower water. Serve it as a dip, side, or condiment. Dried chickpeas are soaked, peeled and then cooked until tender with onion, saffron, salt, and pepper. The beans are then pureed and served as a dip. Olive oil, melted butter, and cayenne can be added as a garnish. Roasted peppers and ripe tomatoes are sauteed with Moroccan spices, garlic, and herbs to make this zesty, popular cooked salad. Mash it into dip-like consistency and serve it with a crusty bread such as Moroccan Wheat Bread. Zaalouk is a delicious cooked salad made with eggplant, tomatoes, garlic, olive oil and spices. It's a common side dish to many meals and is usually served as a dip with crusty bread. Also, try ​Zaalouk with Roasted Peppers and Roasted Eggplant. 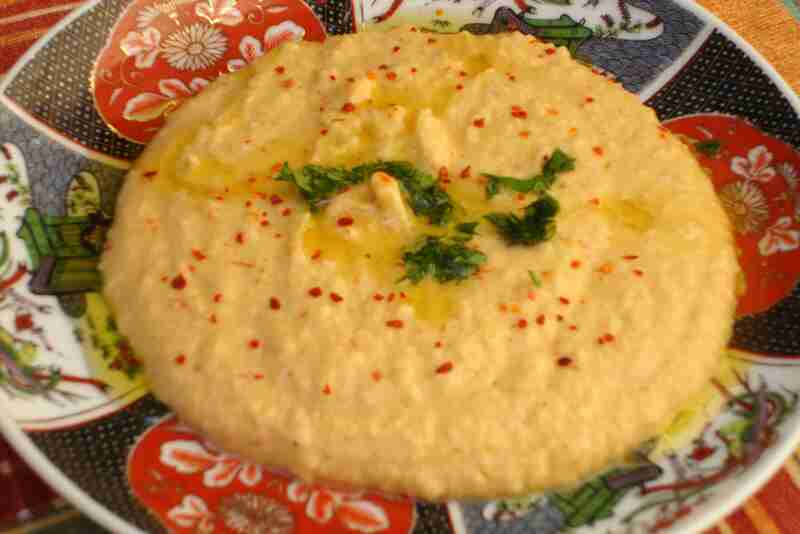 Zaalouk of Cauliflower is prepared by mashing cooked cauliflower and sauteing it with tomatoes, olive oil, and spices. Fresh lemon or preserved lemon adds tangy flavor. Delicious served warm or cold, this dip-like salad is prepared by simmering zucchini and tomatoes with Moroccan spices, garlic, and olive oil. Delicious when scooped up with a traditional Moroccan bread such as Semolina Bread. Also, try the similar ​​Zucchini Salad which is cooked without tomatoes. Eggplant is reduced to a puree and seasoned with olive oil, lemon juice, garlic, and Moroccan herbs and spices. Tangy and zesty, it makes a delicious dip. Either green or black olives can be used to make this easy tapenade. Make it as fiery as you like with the addition of .